Bank blamed the bleak outcome on a "decrease of net fees and commissions"
(CNN) -- One of Japan's largest banks on Friday announced a loss for the nine-month period ending December 31, hit by weak markets and a recession at home. Mitsubishi UFJ said higher credit costs and stock losses also contributed to its deficit. 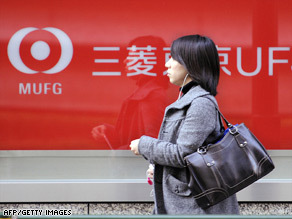 Mitsubishi UFJ Financial Group reported a net loss of ¥42.07 billion ($467.44 million) in the April-December period, its first loss since the group was launched in 2005. This compares to a profit of ¥314.6 billion ($3.44 billion) profit for the same period a year ago. The group slashed its net profit forecast to ¥50 billion ($546 million), from a previous projection of ¥220 billion ($2.4 billion). The bank blamed the bleak outcome on a "decrease of net fees and commissions" in businesses such as investment trust, insurance securities and real estate. Higher credit costs and stock losses also contributed to the deficit, the company said. Meanwhile, Reuters.com quoted Japanese financial daily, Nikkei, as saying the "mega bank" -- which has already taken a ¥100 billion valuation loss due to the stock market downturn -- may face further write-downs since stock prices have continued to fall.